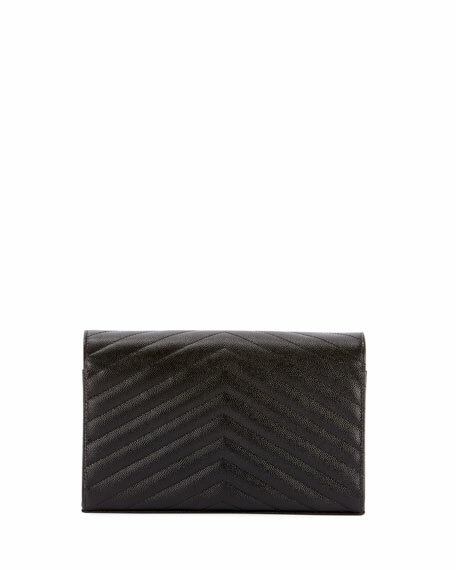 Saint Laurent matelassé calfskin wallet-on-chain. Envelope flap top with logo medallion; snap closure. Interior, grosgrain lining; one bill and six card slots; zip pocket. 4.9"H x 7.4"W x 1.4"D; weighs 12.6 oz. "Monogram" is made in Italy. Loewe engraved calf leather tri-fold wallet with logo stamp. Flap top with snap-button closure. Interior features zip pocket, bill pocket, six card slots, two slip pockets. Approx. 4.7"L x 3"W x .98"D. Made in Spain. Marc Jacobs continental wallet in split cow leather with polyurethane coating. Zip-around top closure. Contrast logo at center front. Exterior, clothing tag print at back. Center zip pocket divides interior. Two bill and 12 card slots. 3.9"H x 7.5"W x 1"D. Imported. Marc Jacobs wallet in split cow leather with polyurethane coating. Top zip pocket with tassel pull. Clothing hang tag detail at back. Three card slots. 4.3"H x 5.5"W x .9"D. Imported. Saint Laurent smooth lambskin crossbody bag with beaded bandana embellishments. Curb-chain shoulder strap, 18.9" drop. Flap top with snap closure. 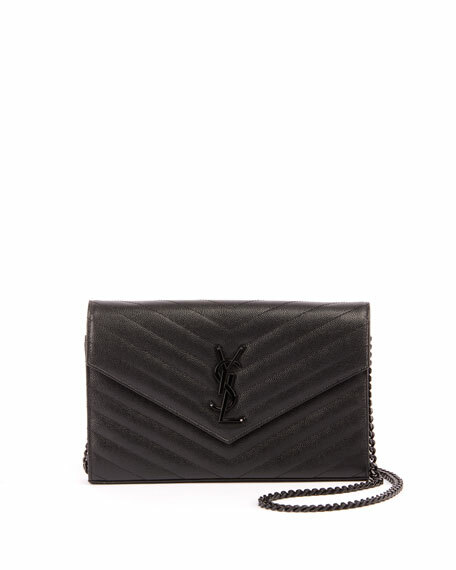 Saint Laurent smooth lambskin crossbody bag with beaded bandana embellishments. Curb-chain shoulder strap, 18.9" drop. Flap top with snap closure. Signature YSL at center front. 5.5"H x 8.9"W x 1.6"D. Made in Italy.